Project management software has the ability to optimise your projects and to make them more efficient and effective. Free project management tools further increase effectiveness by reducing costs. In today’s technologically advanced world there is no need to go through the long and complex task of writing out and planning your project with a pen and paper. In this article you will learn about what project management software is, how it can benefit your projects, whatever they may be and about the free tools available with the Sinnaps free project management app. Project management software gives you the ability to manage your projects online. It is a platform that helps you to plan organise and manage all aspects of your project whatever they may be. There are many useful elements to project management software that project managers can use to coordinate and track project progress. There are also many benefits associated with software and the tools that it provides which will be discussed later in the article. Project management software allows you to plan out the activities and tasks associated with your project across a timeline, allowing you to keep track of the process of your project while also communicating the project plan and its progress effectively to team members and other key stakeholders to the project. Project management software is usually paid for on a subscription basis, which is still cheaper than that of on premise licensed software in many aspects. 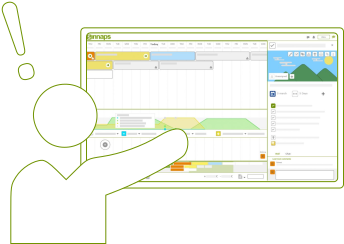 However, Sinnaps project management software offers you a project management freeware option that comes with an array of project management tools which will be discussed later in the article. How can Project Management Software Benefit your Projects? There are several key benefits associated with project management software and they are the main reasons for which all types of organisations move towards using software to manage projects. The clients and suppliers to a project are majorly important to its success. Clients normally wish to be kept in the loop in terms of how the project is going. Project management software that clearly portrays the project progress is a fantastic communicative tool for both clients and any suppliers upon which the team may be dependent. Using a web browser to open your software, such as Sinnaps, is a lot quicker and easier than writing out a project plan by hand. Mistakes can be easily corrected, and the visualisation of the project is much more effective. Technology has made a lot of aspects of our lives a lot faster and project management is definitely one of those aspects. Cloud based project management software tools, such as Sinnaps, store everything on the cloud. This means that all the data to your project is not at risk of being lost. This includes project plans, documents, reports etc. Teams are becoming more and more decentralised. This means that teams are not only made up of local people in an office. Team members can be abroad or working from home etc. Software allows for constant access at any time and any place that a team member may be. Resources and costs are crucial in project management and they must be controlled and monitored. Project management software such as synapse offers budget controls and re-sauce measurements so that the project team can keep track of their use and avoid going over budget which is beneficial for both the team and the potential client with whom they may be working. Thanks to the fact that everybody has access to the software along with its various communicative tools, collaboration is greatly enhanced. Team members can give their own imports or ways in which they feel the project and its tasks can be improved. Healthy conflict can be harnessed throughout the project that increases the potential for a truly quality outcome, which will increase motivation throughout the team. Communication that is clear and open and consistent is key to project management. Project management software is a great communicative to for everyone involved in a project. People are given access to the software and can see clearly what is expected of them and keep up-to-date with the project progress. Any doubts or problems can be easily resolved with live in-chat features that are available on project management apps such as Sinnaps. Instead of having to calculate a project critical path in your own head, the beauty of software is that it calculates your projects critical path itself and also automatically update the critical path along with any changes or modifications introduced. This is a major time saving capability of project management software.